Modern Earth as is, or maybe 5-10 years into the future, so every major nation (US, EU, Russia, China) had time to build up its space capability to launching a few tons once a week, and any currently experimental technology could be made practical. Tensions between superpowers (both old and new) escalated to armed conflict limited to space (the current ban on space weapons has fallen). Specifically, the focus of this space war is sending and shooting down low-orbit satellites that record events on the surface (e.g. lip-reading conversations through windows), or hack into cell phones and even WiFi (assume technology did develop enough for that). We can assume that these satellites require a large dish antenna, so they are detectable. Let's assume no ground-level action (no nukes, no land invasion or attacking the space facilities). And no dropping tungsten rods onto cities. Perhaps the whole space war is happening secretly, as no country wants to start WWIII. Or countries cannot prove who attacked them. Can one "control an area" in space? How can US Space force keep its enemies from flying over the US mainland? Would placing assets in space make it easier than launching missiles from the ground? I do not think we can keep a space station "handing" over US in low-earth orbit, and geostationary orbit is too high up. It seems a viable attack method is to send a tungsten rod (or a swarm of tungsten balls) to collide head-on with the enemy. There could be a guidance system, but most damage comes from orbital velocity of the object. a. It is viable to hit a space station from across the globe without a guidance system? Can guidance system avoid using a radar (which can be detected by the target)? b. What is the defense against it? Can a space station be armored against this, or detect and evade in time? Can projectiles me made of a material that is invisible to radar (e.g. crystal)? Is it viable for a space station to make constant but small and unpredictable changes to its orbit to avoid this tactic? Is it more viable to have a swarm of smaller vehicles, both detectors and attackers, sitting in orbit and waiting for orders? I.e. will the swarm-building nation beat the station-based nation given same resources? Can one make a stealth satellite, i.e. one invisible to radar? a. Can one make a satellite invisible in infrared, at least if viewed from some (or most directions), e.g. by minimizing heat produced on board, and radiating it in a very narrow cone? These are just ideas; main question is how would warfare play out in general, so feel free to suggest things that I did not think about. In general space is still expensive, so conventional warfare would be the way to go, but I digress. Regardless of goal, the safest way to kill an enemy satellite would be to deorbit it, preferably by hacking it. We live in a time where cyber weapons are a very real thing. Just check out this wikipedia section. The USA destroyed perhaps 1000 nuclear centrifuges using an incredibly advanced piece of malware that had stealth as the primary goal (it took a very long time to figure out that they got hacked). Why spend millions of dollars on sending a big rocket into space to blow a satellite up when you can just hack it? The reason why deorbiting is the safest way is because if you blow it up, you will end up sending hundreds if not thousands of tiny pieces into space, which could potentially collide with your own satellites. Kessler Syndrome benefits no one, unless you're some sort of spacefaring anarchy nation. To answer the rest of your questions, controlling an area isn't exactly as easy as it sounds. The whole reason why the US got involved in the Space Race was because citizens feared the USSR's capability to send satellites above the US with ease, without any easy way to shoot them down. You could shoot any trespassing satellites with a missile. In fact, the Chinese did that back in 2007 by testing an anti-satellite missile. The US also did that with one of their own satellites that had malfunctioned. Either way, doing this on a massive scale wouldn't work too well. Kessler Syndrome doesn't help anyone. Tungsten ball launchers would work, but keep in mind of Newton's famous "an object in motion stays in motion, unless acted upon by an outside force". Should those balls miss, they might hit something or someone down the road. Perhaps it will land on someone's house (though if the balls are small they might just burn up), or hit one of your own satellites down the road. Again, you add more debris to LEO, which may also start Kessler Syndrome. Any large debris could be tracked, so any potential collisions could be mitigated by having the power of hindsight. If we know that debris may hit us, you can maneuver the station to avoid the debris. Also you don't need anything huge to do great damage to a space station. Although the ISS has lots of shielding, anything the size of a bullet could punch a hole and cause depressurization. 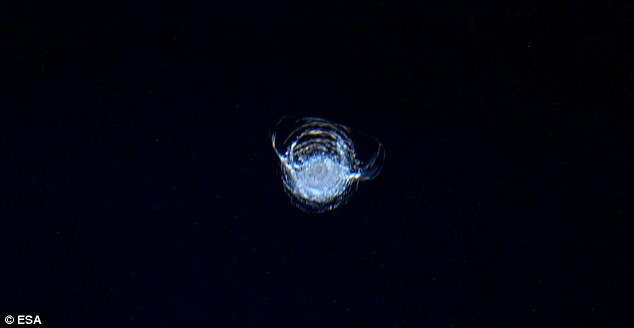 Take this picture of a paint fleck that hit a window of the ISS. You can constantly change the space station's orbit, but that costs a lot of energy. Not too sure about stealth satellites, that's not my forte. Not the answer you're looking for? Browse other questions tagged science-based technology space near-future tactics or ask your own question. How do I make a space battle both realistic, with physics in play such as no sound and weird motion, but also very epic and intense still? How to put satellites in orbit on my ringed world? How much bandwidth could you get if you used every wireless communications device in a hemisphere? What if aliens invading Earth turned out to be invisible? Is there actually a way to create total orbital denial?